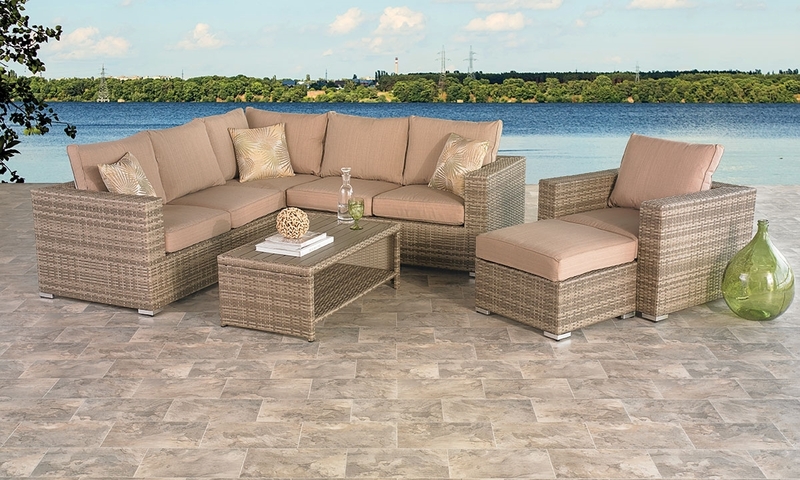 Versatile neutral set includes 3-piece sectional, armchair, ottoman and cocktail table handcrafted from all-weather resin wicker. Enjoy timeless style and comfort with the Baja outdoor living room. This contemporary set comes complete with a sectional and armchair featuring angular track arms and deep seating, as well as a matching ottoman and cocktail table. Each piece features a durable aluminum frame beneath neutral hand-woven resin wicker to withstand the elements, complemented by comfortable weather-resistant cushions.